S ome people have weird hang ups about thrifts stores, but I don’t. I cannot tell you how many times people have looked at me bewildered when I’ve mentioned thrifting. I think they equate shopping at the thrift store with being poor and that’s not always the case. I shopped at the thrift store when I had nothing in college and I still shop there now. Here is a list of 8 things you should consider buying from the thrift store. 1. Hangers. I’ll never understand why people buy hangers brand new. Hangers are literally, wiry pieces of metal or plastic that have no value and are never seen. I’ve moved 3 times in the last 3 years and I’ve only bought hangers from the thrift store. 2. Toys. Toys are expensive and I’m not in the business of buying expensive toys that are just going to be broken and forgotten. My kids know the toy section in each thrift store like they know it in Wal-Mart. One time got a $200 Smart Cycle for $5.00 from the thrift store. I take the toys home, give them a good wash and its Christmas every week around here and the toys they don’t use anymore are donated back. dishware from the thrift store, each more fabulous than the last. And for those of you thinking “Ew that’s nasty” please don’t act like you bring your own dishes to TGI Fridays. Just run the dishes through the dishwasher before you use them. And they’re good as new. 4. Luggage. Please, please don’t ever buy new luggage. Your luggage is just gonna get banged up or broken or both. Before my mother came to visit us I urged her to buy luggage from the thrift store, but no Zsa Zsa Gabor just had to get fancy new luggage. And just as fate would have it her handle was broken and the airline wouldn’t repair or replace it. Another reason I buy luggage from the thrift store is because I once had a $2.00 suitcase run over by an airplane. They ended up replacing it with a bigger better one which was a win-win for me. 5. Books! I have discovered some of my favorite books from the thrift store for around $2 or $3, and don’t let me go on a military discount day, its going down. I recently read Small Miracles by Yitta Halberstam. It’s become my new favorite book. 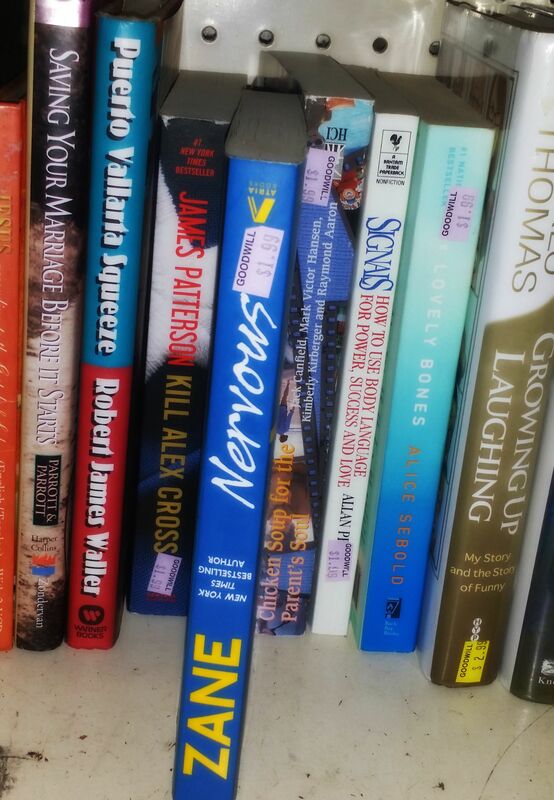 You’ll find books on nearly any topic from the thrift store. And if you’re really lucky and they want to purge a bunch of books, you can get them even cheaper. The thrift store on post is notorious for having 10-cent book sales- and that’s for hard and soft cover books. 6. Picture frames. For some reason picture frames are crazy expensive. I don’t know why 4 chopped up pieces of wood cost so many green pieces of paper. Every picture frame I own has been purchased secondhand either from a thrift store or garage sale and if I don’t like the color of the frame I just spray paint it. 8. Home Décor. This can include paintings, wall hangings, vases, and sometimes-even curtains. Curtains are too freaking expensive and if I’m buying them brand new I have to REALLY like them. Next time you go to the thrift store take the time to really look around. You might be surprised by what your find but you won’t be disappointed. What are some things you buy when shopping at the thrift store? * Thrift Store=A general term for Goodwill, The Salvation Army or any other local thrift store and/or consignment shop. I’m glad we were raised to learn the importance of thrifting. So many people go without in order to buy new, not realizing they could buy more and spend less by going second hand. I think to encourage them but I guess if you’ve never been introduced to it, the concept could be hard to digest. Especially, if you associate used with unclean. Oh well! Hopefully you’ll help them see the light! I know! I’m so glad I understand what’s important to buy new and what can be bought secondhand. I’ve bought some really nice and unique things from thrift stores that I could never find at a regular store. Some people don’t understand the fun and savings in thrifting and they may in fact be the real less fortunate lol. I have bought everything on this list, except luggage from Goodwill. It’s where I shop first. Love this list. Welcome Raki! Goodwill is also my go to store first. Please check out the luggage next time you’re there, it will save you tons! #BMLGirls! You have to get back at it, just think of all the amazing things you’re missing out on and that should motivate you lol! Welcome Siobhan! I love when #BLMGirls stop by! I really hope you do start thrifting, I’ve found some amazing irreplaceable things thrifting, it’s a way of life in my house lol. Great tips super useful can’t wait to search ! I agree wholeheartedly with everything you said! I love to thrift but people look at me like I’m crazy. You sleep on sheets that everyone has slept on at a hotel–the same should be for clothes, linens, etc. Just wash them b4 wearing and you will be fine. Yes Susan, I couldn’t agree more with you. People have too much pride about the wrong things. Thanks for stopping by! I generally post about twice a week about my buys, friend’s buys, contest wins and any other thing I may deem shop-worthy. Susan I will definitely check it out!